At just over 10 years old, Crystal Acoustics is a relatively young company, but the career of its top honcho, Vassilis Tsakiris, as a respected loudspeaker designer and maker, spans three decades. As per Teufel Lautsprecher and M&J subwoofers, Crystal is a direct seller that depends on its products looking attractive, while offering a generous five-year guarantee and a 60-day return policy to ensure potential buyers' confidence. Our review set is the newest iteration of the company's THX product. Adhering to the Select and Ultra 2 specifications, they are made to perform in certain ways and, crucially, still look stylish. This is helped by the shiny, piano black, laminated surfaces in places such as the top of the subwoofer and the face of the towers. A posh, black Ash veneer is used for the rest. 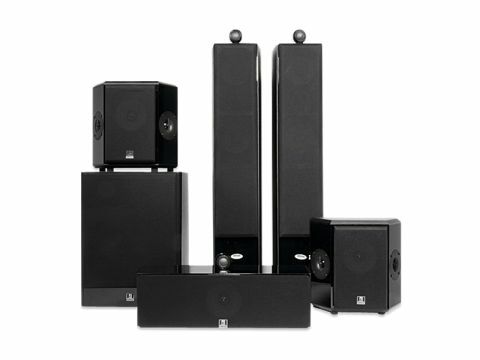 The pair of TX-T2 towers have a brace of drivers and a tweeter, plus a centre that dares to be different and is endowed with one of the drivers that characterise the bigger towers. This is probably far less daring than it at first looks, since conventional speaker design dictates that the central enclosure is voiced equally to the left and rights, even if they are floorstanding. So, when you get a pair of six-inch drivers in a tower with a tweeter between them, the centre tends to have the same driver array, but simply hits slightly higher due to its smaller enclosed volume. In this system's case, the two alluring drivers in the towers have quite different real estate. While they are both the same driver – each with a nice, fat-chromed phase plug protruding from the middle and a smooth-weave glass fibre cone – one has a small-ported cubic (just like the centre speaker) while the lower driver has another, bigger lump of cubic and its own dimpled fat-mouth port. In the towers, this gives a rich depth down to 35Hz, but far less bass in the centre with a bottom cut off at 45Hz. You needn't worry about the bass end, though, as the system comes with a very bog-standard box, with an amplifier in one end and a woofer in the other. This THX-12SUB has a pair of big curvy-mouth ports on the same end as the amplifier's fins and you simply plug the LFE phono right in as mono. It has only 200W of onboard power, which seems a lowish figure until you fire it all up and find it does fill the room. Having been designed to meet THX standards, the rears are Dipoles. This means they are not directed straight to your ears in those channels, but instead produce a diffused rear sonic field with sound effects emanating generally. This is done with push-pull tweeters sharing a midbass. You get the same 7in phase-plugged driver with an identical and attractive looking glass fibre cloth cone, and two high-frequency drivers that perform contrasting functions. They fire along the side walls of your cinema room, with one going in while the other goes out, as it were. If they were to do the same thing and fire outwards along the wall in equal and opposite sound fields, the effect would be called Bipolar. What it adds up to is a set that does what the boys at the THX company say it aughta do. Which is spread left and right by the correct amount, while keeping vertical directivity high, with less up and down dispersion to avoid ceiling and floor reflections, and to fill the room with enough boom to make explosions believable. Some of this steering comes courtesy of the clever 'eyeballs' atop the speakers. These tweeter housings can be swivelled a few degrees in either direction to allow toe-in of the speakers and complete line-of-sight HF directivity for on-axis use. Their construction is critical, as any flexibility fore and aft in movement would allow for a smearing of the detail. In use, however, they were crisp and sweet. I positioned the subwoofer and set it to what I know is a good crossover point for my room (a bit below the 80Hz and lower that pumps from my Pioneer LX-81's LFE feed) and played Avatar on Blu-ray. The planet Pandora is supposed to be richer and grander in scale than any other – and its jungle soundscapes must be all the grander – and this Crystal Acoustics system delivers an impact, realism and sheer scale that utterly belies its compact size. The woven cones possess a snap and edgy detail that is comparable with the outrageously expensive carbon fibre ones used by Morel and the super-posh jobs made of Kevlar used by Bowers & Wilkins. The chaps at Crystal have cleverly designed a kicking drive unit that's far less costly. But THX is not about economy; it is about it hitting the 'preferred listening curve'. When asked, people genuinely liked a steep slope of increasing high-frequency response to make it all 'tinkly' and a fat basso shelf of lifted low-end boom. This very concept is not about musicality, but rather movie excitement, so when you are engineering up to the edge to keep costs down, it is hard to make the speakers kind to music, too. I noted, as Avatar started up, that the system has a vast dynamic and immense impact, and that while I was worried that the tweeter mounts would be flimsy and muffled in output, they are in fact breath-takingly fast, making tinkles and the edges of explosions come across on an epic scale. The midrange presentation was smooth with great intelligibility and definition, even in the midst of sonic mayhem. I loved the accuracy of the placement of the other-wordly creatures, and the Dipolar rears created a lovely spread of jungle to my sides and behind my head. The depth of the soundfield was good too, with sounds placed near or far depending upon the stunning visuals, and I ran the system at a whopping zero dB reference level until it was a bit oppressive. On turning it down slightly, I found that the system was so specialised to do the Big Beastly THX Thing that it was not as linear or easy on the ear at lower levels. It likes to be driven hard. I tried some multichannel music on it and while it was glossy and tinkly, it did lack a certain smooth fidelity that some much more costly speakers can bring to the party. You have to remember that the whole set costs £200 less than my B&W reference HTM3 centre speaker on its own, though. Without its stand. This set offers bold, super-scaled output. Great fun comes as standard, as does a really clean and crisp sound field when it gets hectic. They're not ideal for picking out the third triangle on the left in the orchestra, but they are awesome for the prehistoric dragonfly buzzing behind your head. I'd give six out of five for VFM if I could.